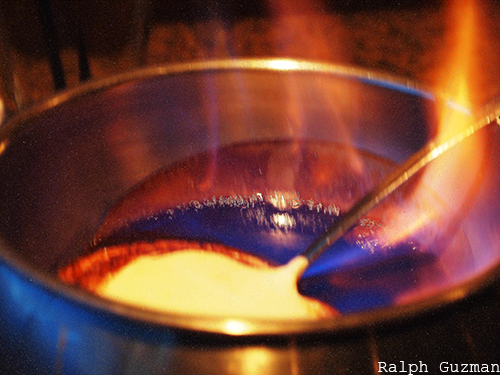 Grand Rapids, Michigan — When one mentions fondues, I am reminded of two sets of things. First: chocolate fountains with fruits like strawberries, pineapples or mangoes on the side. The second would be melted cheese with bread. From my own experience, fondues are either a dessert or appetizer. 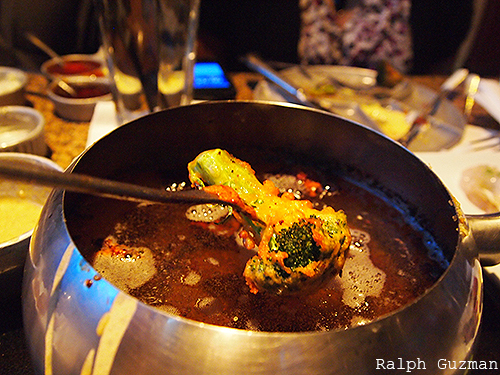 I have never had fondue as an entire meal– until I visited The Melting Pot in Grand Rapids, Michigan. It’s all fondue at this city favorite where a pot of melting chocolate, cheese, or other ingredients is provided together with ingredients that you would dunk into the pot. We took the Couple’s Favorite, which included things all delicious and scrumptious. The order includes the cheese fondue as the appetizer. It also has the salad. This is the only part that’s really not fondue. The couple’s salad allows you to choose two salads from their menu, which includes their House Salad, Caesar Salad, and California Salad among others. I went for the California Salad, which was very delicious. I hope I can replicate this at home! The California Salad: mixed baby greens, Roma tomatoes, candied pecans and rich Gorgonzola cheese with Raspberry Black Walnut Vinaigrette. Wonderful! The main dish is a selection of vegetables, meat, and seafood. Some people, I think, would love or hate this part because you will need to cook the food here using the pot that is filled with oil. Some people love doing this. Others, who feel they go out precisely to actually be served, don’t like it. Well, we all like to do our cooking once in a while, so this was very much welcome. This part reminds you more of a little shabu-shabu rather than a fondue. After cooking the ingredients, you have several dips to choose from to pair with your cooked food. Cooking is very easy. It’s one minute for veggies, beef, chicken, and seafood; two minutes for pork. The cooking only becomes a challenge when you cook several things at once, as some items get overcooked when you do a lot of multi-tasking. So I cooked items one at a time. Also loved the slice of steak. It was medium well when I fried it for a minute. Dessert was even more wonderful. We ordered two kinds of dessert fondues. First was the dark chocolate with grand marnier. The staff flambés it in front of you, which makes it entertaining aside from delicious. Loved, loved, loved the rich combination of the chocolate and grand marnier, which adds a kick to the already delicious chocolate. Now, you are served fruits and pastries to dip. What I found most exquisite was dipping small slices of cheesecake into the fondue. It was pure guilty pleasure. So creamy. Of course, let’s not forget strawberries and chocolate. The second dessert fondue we ordered was the classic smore– chocolate with graham crackers. It was a real delight as well. As of this writing, the price tag for the Couple’s Menu is $77. It’s a splurge, I’d have to say, but it was fairly worth it. So special thanks to my sister Gianina and my brother-in-law, JB for hosting the experience. So when you’re in Grand Rapids, do try The Melting Pot. And the good news: they have locations all across the America. This entry was posted in Rated by Ralph, Restaurants & Food Trips, Travel by Ralph. Bookmark the permalink.